Home > Pasta > Should Grated Cheese Always Follow Pasta? Diners are so used to the arrival of their pasta course being closely followed by the waiter with his trusty grater or silver bowl of parmesan that they can get ever so slightly edgy when the second act of the drama fails to materialise. Usually, what follows are a succession of whispered excuse me's which give way to frantic arm waving as patience wears thin. On some occasions it may be simply oversight on the part of the front-of-house staff, but it is not unknown for the request for cheese to be met with a frosty stare from the waiter. The marriage of pasta and grating cheese is one so enshrined in the public mind that the very thought of their being apart is inconceivable. 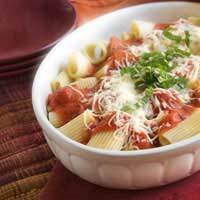 However there are occasions when the pasta dish has to stand or fall on its own merits. Grating cheese means one of two basic varieties: either parmesan or Parmigiano reggiano to give its regal full Italian title, or pecorino Romano. The qualities of fresh parmesan really need no introduction because it is now famous around the world. Manufactured from the milk of cattle reared within a specific geographical area around the city of Parma, each cheese is aged for around 18 months, resulting in the slightly sweet, salty graininess that is its hallmark. The name pecorino derives from the Italian pecora, or sheep, from which the milk is obtained to manufacture it. In comparison with parmesan, pecorino is a saltier, more earthy cheese, lighter in colour than its more famous compatriot. The grating variety is called romano, deriving the name from its origins during the Roman empire rather than the capital city itself, and the main areas of production are the island of Sardinia and the region of Tuscany. Why Are Cheeses Uses as Garnish? So why are these cheeses used as a garnish? Quite simply to complement the sauce, adding an extra layer of richness that enhances the eating experience rather than simply for decoration. It is for this reason that while there are many that benefit from parmesan or pecorino, some do not. The decision comes down in principle to whether the sauce is based on products sourced from the land or sea. Cheese is of course a land-based product and as such should be confined to combinations involving other ingredients found on terra firma. On the other hand, it does not really have any place in a fish- or seafood-based sauce simply because it corrupts the very taste of the sea that is so intrinsically part of the eating experience. Given parmesan's origins in the Emilia Romagna region, it is, unsurprisingly, ideally suited to many recipes that claim the city of Bologna as their home, such as the ragu sauce that accompanies pastas such as tortellini, tagliatelle and lasagne. This is because the milkiness of the cheese provides the perfect accompaniment to many of these beef- and pork-based sauces while the saltiness serves to accentuate the more subtle flavour combination of them. This saltiness can also benefit simple vegetable-based sauces such as garlic and lemon combined with asparagus spears. The relatively mild qualities of parmesan make it unsuitable for dishes where chilli pepper has an important role. Such a dominant flavour is simply too overpowering, and this is where pecorino's saltier, more robust qualities come into play, for example in the Apulian orecchiette and broccoli or the hot Neapolitan puttanesca sauce of olives, tomatoes and capers.If you are using grating cheese, remember to buy it fresh cut in one piece from the block. On no account consider the ready grated variety which will invariably have dried out to some extent despite the best efforts of modern packaging, thereby compromising its flavour.